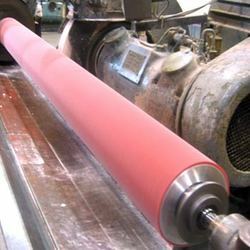 Polyurethane feed rollers are non-conductive, flexible, lightweight, resist abrasion, and often less costly than rollers made of other materials. Precision rollers are available as: concave roller, convex roller, straight roller, hubbed roller, v-groove roller, bearing cover, coated bearing, bushing, and more. Feed rollers made from polyurethane offer high abrasion resistance, elasticity, and impressive load bearing capacity. In addition to rollers, urethane has become a popular replacement for metals in wear plates, springs, and sprockets. Whether you need feed rollers to sand plywood panels or for a crucial industrial application, Gallagher has the right solution for you. Feed rollers engineered by Gallagher undergo rigorous testing to ensure that the final product is tough, durable, and delivers the expected performance. You can count on us to deliver your feed rollers on time, on budget, and within quality tolerances. We offer a choice of hub material including steel, aluminum, and composites. You can also order feed rollers that are engineered to perfectly match your application, whether it is machinery, automation, or equipment. We can also help you identify the best polyurethane feed roller compound and design for your specific requirements.